Prospect Hill Winery produces red, rosé, and white wines exclusively from grapes grown in our Maine vineyard. We have 13 cold hardy varieties of American and French American Hybrid grapes. 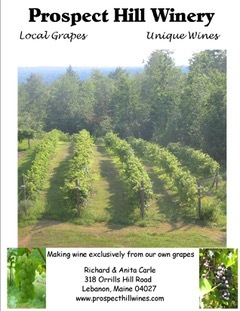 Our fruit is handpicked going from vine to wine on the same day, reflecting the unique terrior of Maine.